Letter of former Guatemalan ministers and diplomats: "An alarming decision on the future of CICIG"
The decision by Guatemalan President Jimmy Morales not to extend the mandate of the International Commission against Impunity in Guatemala (CICIG) a major national and international setback for a huge global problem—just as he himself is being investigated for alleged violations of campaign finance laws. We the undersigned—former foreign ministers and diplomats from Guatemala—are deeply concerned over Guatemalan President Jimmy Morales’s Aug. 31 announcement that he has decided not to extend the mandate of the International Commission against Impunity in Guatemala (CICIG) when it expires in Sept. 2019. We feel a responsibility to share our views of this decision because of its likely impact on the fight against organized crime and corruption in Guatemala—a matter of both national and regional importance—and because it directly affects Guatemala’s image abroad and will negatively impact our country’s foreign policy and international relations. How should Morales’s announcement be interpreted? What message is his government sending to Guatemalan citizens? 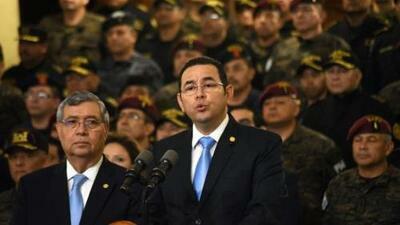 What message is Guatemala sending abroad? Departing from the formal, cursory explanation provided in a note addressed to UN Secretary General António Guterrez, Morales in his public announcement offered a series of unconvincing and self-serving arguments about this decision. Even more disturbing, however, were the bizarre optics of the president appearing in the National Palace with his vice-president and ministers of foreign affairs and internal security, surrounded by dozens of uniformed military and police officers. Just an hour or two earlier, the government had deployed a fleet of military vehicles to the streets surrounding CICIG headquarters in Guatemala City. The vehicles, many armed with high-caliber machine guns, were originally donated to the Guatemalan police by the U.S. Government, a fact the U.S. Embassy quickly and disapprovingly noted in a Tweet. These unseemly displays of military and police force missed the mark if the intention was to bolster the outdated arguments President Morales offered about the need to defend Guatemala’s national sovereignty against “international interventionism.” Those arguments, coupled with the show of force, simply feed internal polarization over CICIG’s role and signal that the President is turning his back on internationally supported efforts to fight corruption and impunity—a major national and international setback for a huge global problem—just as he himself is being investigated for alleged violations of campaign finance laws. What was also abundantly clear is that President Morales, especially with respect to CICIG, no longer depends on the support of his civilian cabinet or on leaders from civil society but instead on the country’s security forces. The message seems to be that from now on his government will rely on military support rather than democratic politics. It also would seem that the President wants to make sure that when his term ends in 2020 there is no longer any CICIG to investigate him. This is corroborated by the fact that the professional investigative capacity of the national police—which took more than 20 years to develop following the Guatemalan Peace Accords—has been systematically dismantled in recent months. The President’s actions show a complete disregard for the fact that Guatemala has elections scheduled for 2019 and that a new government may want to have its own say on whether CICIG stays or goes. Morales made it clear that he intends to get rid of CICIG before the next government takes office in January 2020. In attacking CICIG—which most Guatemalans view as indispensable to the fight against corruption and the consolidation of democracy—the President and like-minded critics argue that it is part of a larger international conspiracy that is working with internal allies to destabilize the current government and eventually to ouster it. This argument conveniently forgets the original reasons for CICIG’s creation—high levels of corruption in all three branches of government—and ignores the fact that eradicating such deep-rooted corruption will take more than a year of technical know-how transfer and would require a high dose of political will from the authorities, something that is clearly lacking. For all these reasons, we are deeply disturbed by the announcement that CICIG’s mandate will not be renewed and concerned about the many negative consequences that would follow. Fortunately, a growing chorus of domestic voices is expressing opposition to the decision and support for CICIG’s ongoing work with the office of Guatemala’s Public Prosecutor. These voices need to be heard internationally as well, so that it is fully understood abroad that the Guatemalan people do not support Morales’s decision nor the gratuitous display of military force that accompanied his announcement.